In a fast-moving world with an uncertain future, it’s a healthy reflex to spare a few days to get away from the daily bustle and reflect on the many business challenges the future will bring. FUTURO aims to inject you with a fresh dose of inspiration. In the amazing setting of the Tuscan Crete Senese (near Pienza) three friends Tom, Joeri and Herman will share their particular view on how markets and society are converting and what will be happening in the coming years. In 2 full days we will cover up-and-coming trends in food & FMCG, retail & hospitality, lifestyle & tech that will affect your business, marketing, product design and HR strategies. Join Herman Konings, Joeri Van den Bergh & Tom Palmaerts on the FUTURO Getaway to broaden your horizon, sharpen your mind and refuel your vision. 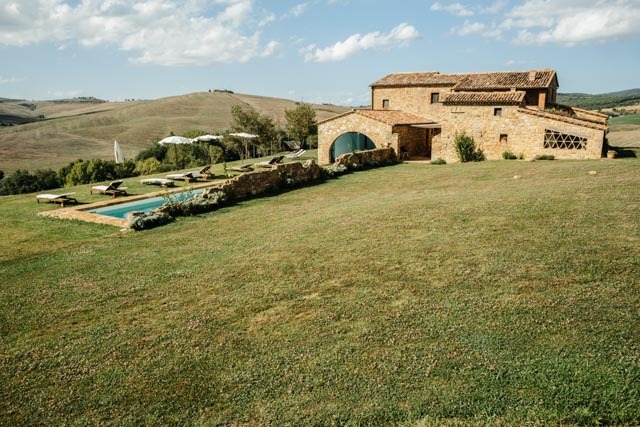 Two beautiful Tuscan casas with all ensuite bathrooms, pools and comfort in the hills of the scenic Crete Senese near Pienza and San Quirico D’Orcia. The workshops take place in the magnificent Casa delle Sorelle. A shuttle service will be available for all necessary local travel (from/to airport – from/to accommodation etc.). In order to enjoy the entire FUTURO program, we have a list of preferred flights. Please get in touch if you will arrange an alternative travel schedule. Click here for an overview of previous FUTURO participants. When cancelling your participation 6 till 4 weeks before the event, a cancellation fee of 1,950 € (VAT excl.) is due, during the last 4 weeks, the cancellation fee is 3,999 € (VAT excl.) for the spring edition and 4,499 € (VAT excl.) for the summer edition. A replacing participant is allowed at any moment.